Moving SQL Servers from on-premises to the cloud can bring significant benefits—as well as challenges, especially during the transition. As an AWS partner with Microsoft Workloads Competency, SentryOne can provide expert guidance as you're migrating SQL Server workloads to Amazon Elastic Compute Cloud (AWS EC2) or to Amazon RDS for SQL Server. SentryOne solutions not only pave the way for a smoother migration, but also ensure that your Amazon cloud-based workloads are optimized for peak performance. SentryOne provides end-to-end migration and optimization solutions for shifting SQL Server workloads to Amazon EC2 or Amazon RDS. SentryOne is the most capable, scalable solution for optimizing performance of SQL Server—on-premise, in virtual environments, and in the cloud. As an Amazon Technology Partner, we've worked side by side with Amazon engineers to ensure that data professionals have the detailed information they need to proactively manage their cloud-based databases for peak performance, whether on Amazon EC2 or Amazon RDS for SQL Server. 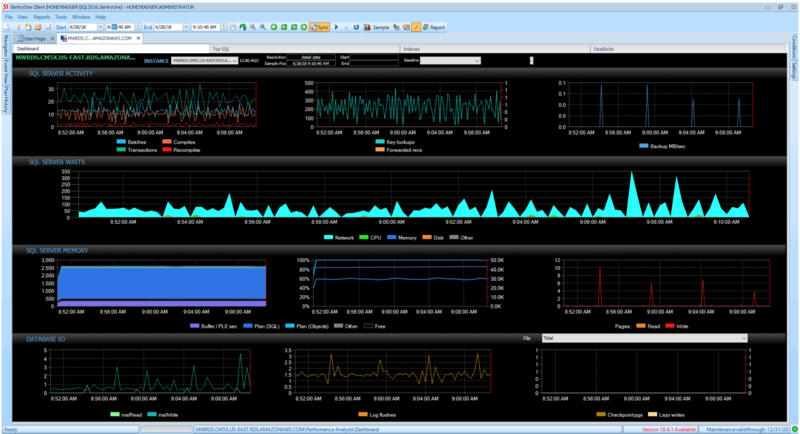 Proactively monitor, diagnose, and optimize SQL Server workloads on Amazon EC2 with SentryOne. SentryOne provides the most detailed metrics for monitoring Amazon RDS for SQL Server, beyond those captured by Amazon CloudWatch. Complete a SentryOne demo and receive an Amazon Echo Spot ($90 value)! 1. Fill out the form at right with "AWS re:Invent" as the Topics for Discussion. 2. A SentryOne team member will contact you to schedule your demo. 3. Deploy the SentryOne AWS Marketplace Image. 4. After you've completed your demo, we'll send you your free gift of an Amazon Spot.